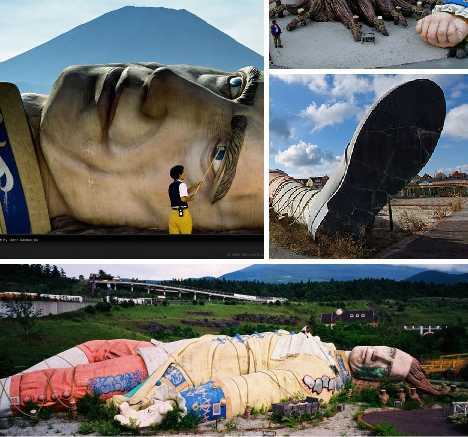 A monumental statue painted in sun-bleached pastels reclines in the grass at the foot of Mount Fuji, its face covered in graffiti, in photos captured during the brief existence of Gulliver’s Kingdom by Old Creeper (photographer Martin Lyle). This theme park, located adjacent to Japan’s famous ‘suicide forest’ which reportedly has the world’s highest suicide rate after San Francisco’s Golden Gate Bridge, opened in 1997 as part of an economic stimulus for the region. The park aimed to take advantage of the millions of tourists who visit Mount Fuji each year and seek other activities in the area. The $350 million complex had financial troubles from the start, but it was the shadow cast by another unpleasant neighbor that might have ultimately led to the park’s closure in 2001. The nearby village of Kamikuishiki was the location of the nerve gas production facility used by the cult Aum Shinrikyo, which carried out deadly gas attacks on Tokyo subways and other locations in 1995. Locals complained, during the time that Gulliver’s Kingdom was in operation, that they could still smell the chemicals in the air. 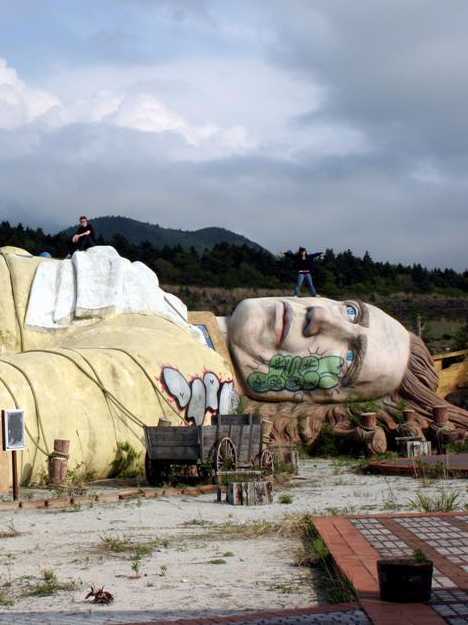 The park, along with its iconic 45-meter statue of a prone Gulliver, was totally demolished in 2007. 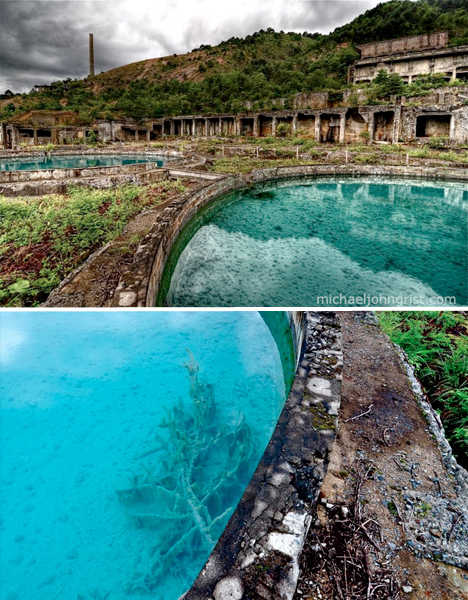 The vaulted structures of the Osarizawa Mine give it the appearance of ancient ruins, and the pools of crystal-clear blue-green water seem temptingly refreshing. But you probably don’t want to dip your hand in. Those pools are almost certainly filled with run-off of toxic chemicals, the legacy of a gold and copper mine and smelting facility that closed down in 1978. The blue color comes from traces of malachite. The site is now owned by Mitsubishi, with guards that will apparently try to railroad anyone caught loitering into paying 1,000 yen to go on a bus tour, but there’s a good reason for that – the structures here are so damaged, they’re really quite dangerous. 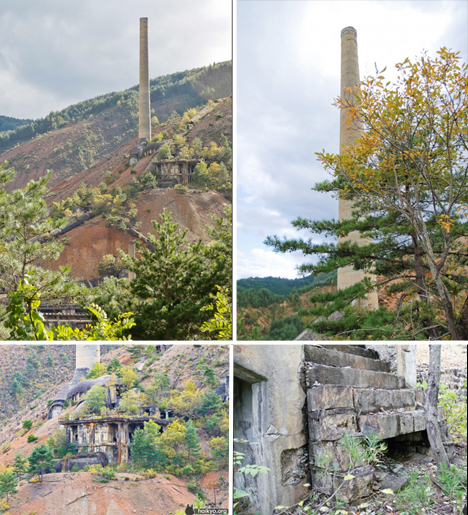 Osarizawa is just one of a number of abandoned mines in the Matsuo mountains of northeast Japan. 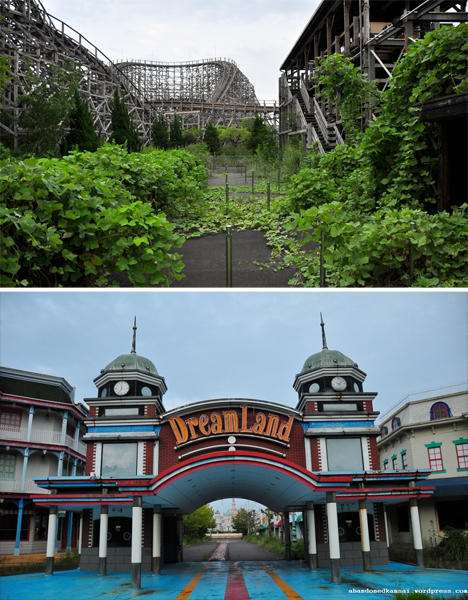 Another abandoned theme park in Japan features an incredible wooden roller coaster that’s half-overgrown with ivy. 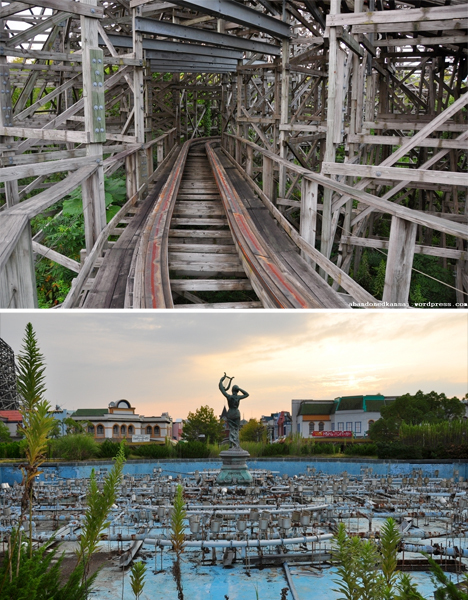 Modeled on Disneyland and Coney Island, Nara Dreamland opened in 1961 and operated for decades, but the early enthusiasm of visitors began to fade, and by the time it closed in 2006 it had already been a virtual ghost town for quite some time. The park has been given over to nature, its future unclear. Guards patrol the grounds and extract heavy fines from any explorers they catch trespassing, and beyond that, there are cameras, sensors and alarms. But some photographers get through anyway, luckily for us. The blogger at Abandoned Kansai has accessed the park many times, day and night, with varying levels of success, capturing dozens of photographs along with a few videos.